A Unique boat - lovely paint finish..
Hand Painted "Fish" Pop Pop Boat - Green. (Base colour may vary). Lovely paint finish with an image of a Fish on the top deck. Complete with Fuel Holder, Candles, Priming Dropper and Instructions. A nice addition to any collection. Please note - design may vary slightly as these boats are hand painted. 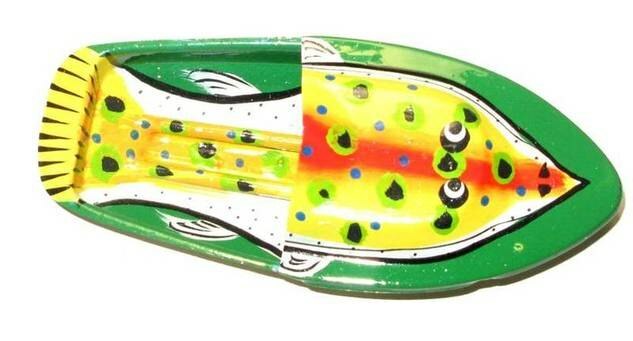 Hand Painted "Fish" Pop Pop Boat - Black. Hand Painted "Fish" Pop Pop Boat - Yellow.